It’s 3:47 pm. Almost time to start dinner. Looking around, listening to their sibling laughter in the other room, staring at the school papers, toothpaste, conditioner, water filter for the fridge, and receipts on the kitchen counter. The last little to-do’s of the day. If I’m being completely honest, what really stacks up in my house is laundry. If anybody knows anyway to teach me to the love the bane of my existence, please tell me. In all truth, I thought the day that I realized my washing machine had a delayed start I would be forever changed. At night, before bed, I’d load the washer and set the delay start for 4 am. In the morning, I’d wake up and put the clean clothes in the dryer. At the end of the day I’d fold the clothes, put them away, grab another load of dirty laundry. I’m sure some of you have figured this out and are probably doing it with wild success. It usually falls apart somewhere in the middle of the day (you know - that time between opening my eyes and laying back down in bed) on the days that I don’t follow the plan. Plan? What is this plan you speak of? Last year, the masterminds of Doulas of Cincinnati (that’s Emily and me) sat down on a gorgeous Spring afternoon - in her king sized bed to be exact - and laid out the most glorious plan to keep us on track with all the chores that need to be done in our homes. Because life and laundry stack up. Because we’re busy working moms, and we want to maximize time to have fun with our families and enjoy the self-care we deserve (bath bombs anyone?). We were so proud of our accomplishment we even took a selfie. So back to the honesty thing. It’s been nearly a year. Do we do the plan exactly? Everyday? Well, no. Because no one is perfect. Life and laundry, remember? We give ourselves grace, and get back to it tomorrow. Hung in the kitchen or office with a dry erase marker. This. Plan. Is. Life. Changing. And, if you’re in the company of an amazing housekeeper, this handy workflow will get you through the light tasks until their next visit. Either way, we’re giving you a way to prioritize your day so you have plenty of time to relax and do all the things you love the most. You're not alone. Join the hundreds of clients and students we've helped and get access to our Ultimate Daily Cleaning Checklist today. 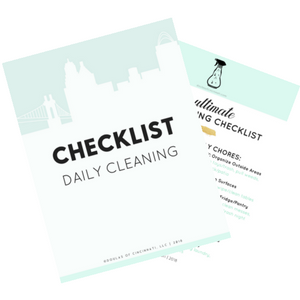 Your Ultimate Daily Cleaning Checklist is on its way!